It seems like a blink of an eye and it's time to hunt for food at Bazaar Ramadan pulak. Mamarazzi asked if I wanna follow. I told her no coz I wanna play with Jie Jie Lin. Anyway, they went to the Bazaar Ramadan Shahbandar again. 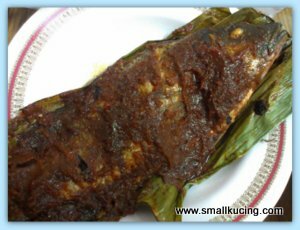 Bought the Ikan Bakar again. This round they found the Nasi Minyak John. Fuiyo...long queue. While queueing up, Mamarazzi spotted this Rojak Ayam. Thinking of buying but did not as there would be too much food on the table. 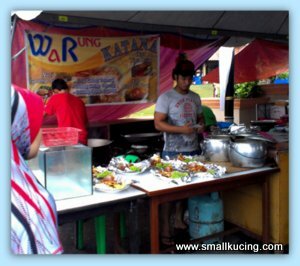 As they were leaving, Mamarazi spotted Warong Katana also have a stall at the Bazaar. Fuiyoh! Their prepacked rice looks so yummy! 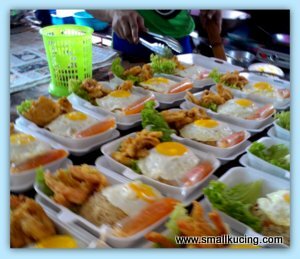 A Packet of white rice with one fried egg and Fried Squid cost just RM4!!!. That is pretty cheap in Mamarazzi eyes as the portion of "Sotong" was quite big. 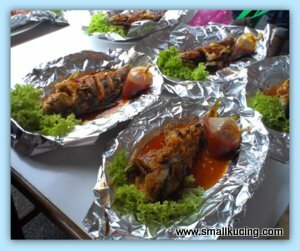 Mamarazzi was drooling at the "sotong" but too bad, she had already "tapau-ed" Nasi Minyak John. As Mamarazzi was drooling at the fried sotong, Papa asked them if they would sell just the Fried Sotong without Rice. The man said yes, but will be according to weight. Yummm....Sotong goreng. 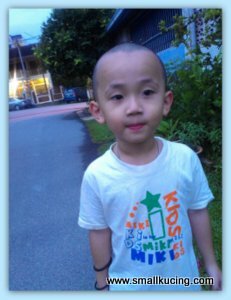 Was a bit soggy when arrived at Ah Mah's house due to put into plastic bag while it was still hot but still taste quite good to Mamarazzi. Beef to go with the Basi Minyak and again it's too much oil but the redeeming quality is that the beef was tender. 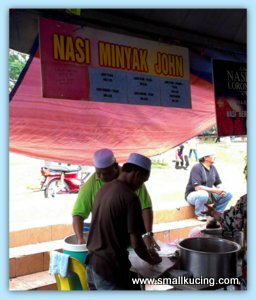 Nasi Minyak. Unfortunately, this round the rice was a tad soggy for Mamarazzi's taste. Previously bought from this stall the rice was okay. Guess, the chef "opps" on this day. But don't care la. 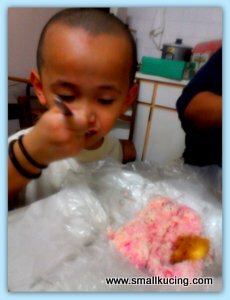 Have to eat fast fast coz Papa said wanna bring me outside the house to see the KABOOM . However, by the time I finished eating Papa had turned into a Phyton and asked Mamarazzi to bring me outside to watch instead. Where? where? where is the KABOOM? KABOOM!!! Alamak....Mamarazzi's hand was too slow....did not managed to catch the fireworks. Only caught the leftover "kentut". Well, if you really wanna see the beautiful firework, here is a video that Mamarazzi managed to capture using her "lauyar" phone two years ago. The KABOOM is to signal it's time for prayer and time to"berbuka Puasa"(where the muslim can start to eat after fasting whole day during the Ramadan month). There are KABOOM sound during dawn too. Three times. To signify time to start fasting. But Mamarazzi is not sure whether there are fireworks or not as it's too early to go out of the house and see. That goreng sotong is definitely scrumptious. I would love it. The Ramadhan food is making me fatter now. All the gorengs and bakars plus kuehs are so tempting la. I can understand why you bought so many things. I didn't know KABOOM to watch! Next time ask me to go too.... kaboom! I had never seen the Nasi Minyak before! Maybe I saw other colours. Must it be reddish like that? My Letchumi told me she can treat ADD/ADHD kids as she was trained on this issue before. When I meet you at the BOOM BOOM night at KLCC, you and her boleh cakap & bincang lo. 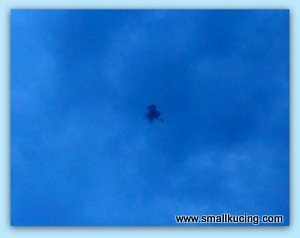 Small Kucing...I think to see 'papa turn into phyton' is much more interesting than watching the kaboom? !...on the other hand, I like your posted photos best...you're so expressive in your ways and so CUTE! Hi SK, wow! Love the dishes! I sure will love trying out the various dishes. Love sotong sambal too. And rgt 4? Thats our Cdn $1.25 cents. Holy Smoke! Very interesting, the Kaboom!!! Everything looks soooo good - next time you wanna go back KT, let me know...I wanna follow. Don;t think I want the pink rice though...no, thank you. hahahaha, dinner from the pasar ramadhan again?? i guess there must be too many things to try there huh?? yalor, the rice so nicely packed.. somemore all neatly arranged there, look at the colors, they are really attractive..
i think food in pasar ramadhan are generally not expensive at all, i heard it's a month of giving so they don't really want to be calculative..
wah, so nice lah, got fireworks one!! this is surely not something common in KL hor?? 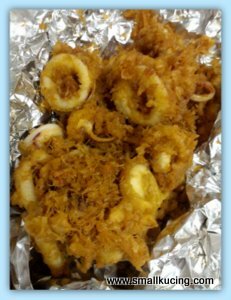 The fried sotong really looks yummy. The Ramadhan bazaar near my house has less than 10 stalls...mmm come to think of it it's not a bazaar lah...haha. Oh, got kaboom there...I didn't know the meaning behind it. Always enjoy walking with Mamarazzi to see the good food. We like seeing your grow, young man. Thank you for teaching us about the kaboom! Papa and mamarazzi sure know how to find the best food in Pasar Ramadhan! Sometimes I'm very teruk one, go to pasar ramadhan, look around and return empty handed. Why? Because there's so much to get and I can't eat all, thus come out blur blur, undecided. KABOOM is the firecracker to indicate sahur and iftar? Normally we'll hear siren only, right? The gendang I hear a lot, when in kampung.. I lupa about the "kaboom" thing. Oo really ah? do they have fireworks too? The nasi minyak so PINK! 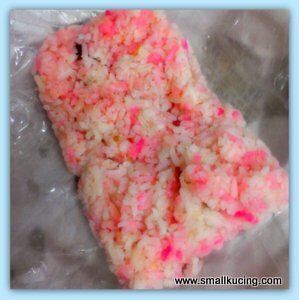 Here the nasi minyak is pink, Lina. Must cook nasi minyak soon. 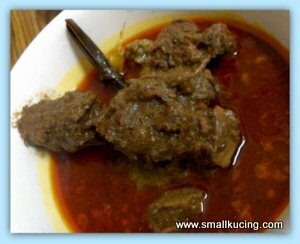 And beef curry, Terengganu style. Cannot tahan. sotong also need to weight? 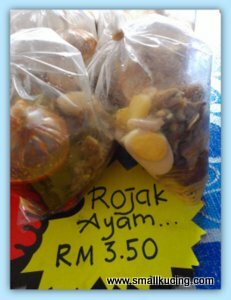 what is the rojak ayam? I love any kind of Malay food but the bazaar is out because I cannot tahan the crowded and difficult to find parking situation. I love how those baazar prepare the nasi ayam! make it so tempting eh! In my place only siren, no fireworks or kaboom. It must be amazing to get to see fireworks everynight. I love fried sotong too...Miss them.